Basically, they are one of the biggest website template marketplaces on the entire Internet. But their activities are not limited to selling themes. They also offer different tutorials and courses for both rookie and experienced developers. And recently, they have launched the TemplateMonster marketplace. It allows every developer out there to upload their themes and start selling them in a matter of a few clicks. All that is required is an organized archive. So, if you have your own themes that you would like to sell or know someone who does, we highly recommend you check the TM Marketplace out. Premium WordPress themes are created by professionals to save you lots of time, which can’t be said about free ones. Non-premium themes are often infested with bugs, so in order to get everything working, you’re going to have to invest lots of your precious time into fixing them up. Oh yes, and you also need to know quite a few things about coding in order to get them to work as intended. Premium templates, on the other hand, boast an overall better quality and give you access to the 24/7 support hotline. So, if you ever encounter any troubles in one of those, you can always ask the support team for help. Well, it’s an overall great platform with extreme flexibility and good user-friendliness. This system is free and open-source, it is available to absolutely anybody. There also exist thousands of custom plugins for it, which further extend its functionality, making WordPress the perfect tool for creating any type of website. But enough talk, let’s move on to the templates themselves. Check them out! 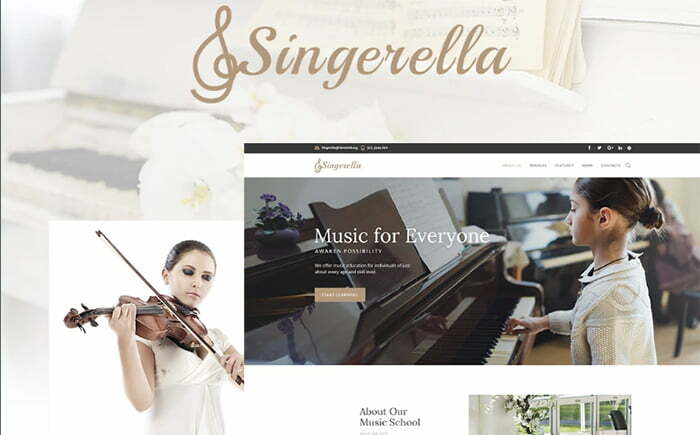 This elegant theme is perfect for presenting your musical education business in a very attractive way. Its live search and thought-through MegaMenu will help your visitors navigate your website easily. It also comes with a number of post styles and layouts as well as the Elementary page builder for maximum customization. 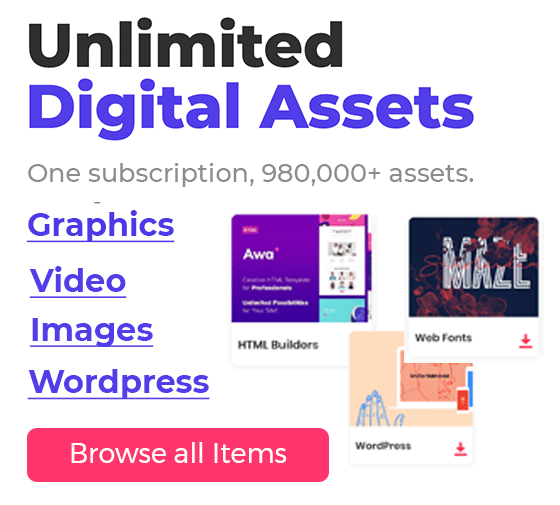 The template is packed with a set of awesome plugins like Smart Slider, Cherry Testimonials, Ecwid, Cherry Projects, TM Timeline and others. 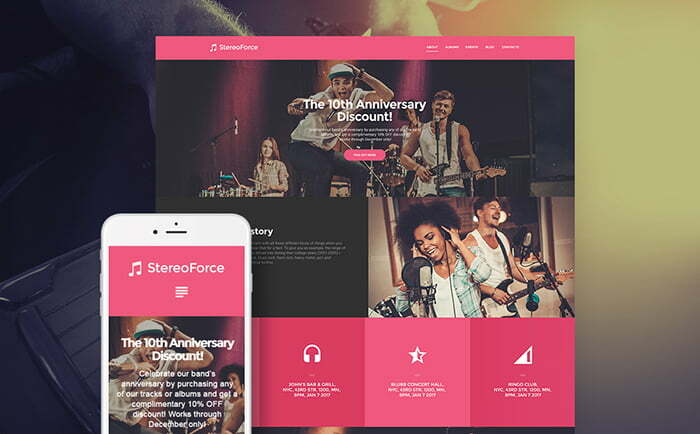 This is a fully responsive and cross-browser compatible theme designed to kickstart your website project. It comes with a rich number of static and dynamic elements as well as the Power Page Builder and the WordPress Live Customizer to spice up your content. It is Ecwid ready, enabling you to create an online store on your page in a matter of minutes. The theme is also bundled with a set of Cherry plugins and 15 topical images to suit your theme. This is the perfect theme to use if you play in a band and wish to promote it. It comes with custom widgets like pricing tables, animated counters, and an image slider to give your site a more innovative feel. Customization will be a breeze with the Power visual page builder that doesn’t require you to know a line of code to use. The theme also features Projects functionality that can be used to display your works with images and flashy call-to-actions. This is a clean and fashionable template that emphasizes full-width background imagery heavily. Its design is fully responsive and adaptable to absolutely any kind of screen resolution, providing a comfortable browsing experience to your visitors no matter the device they use. The drag & drop Power Page Builder will let you customize your pages the way you see fit. The theme also utilizes the Timetable plugin, allowing you to inform your visitors about your events, parties, etc. 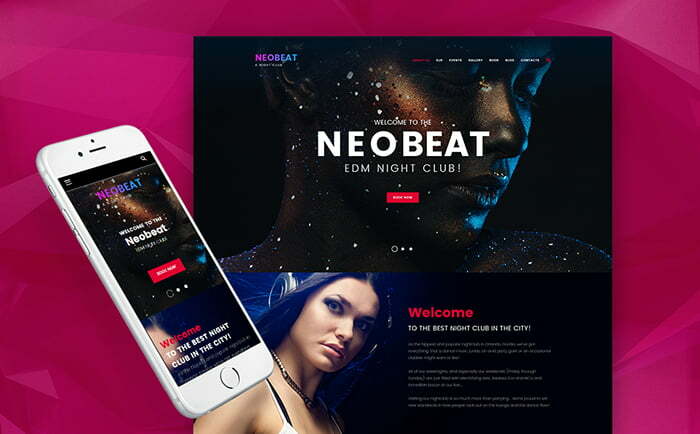 This stunning template will definitely catch your visitors’ attention with its fully responsive design and background videos. It will also help you keep your customers informed of all upcoming events with the help of an elegant events calendar and a built-in appointment booking plugin will let them, well, book tables online. The TM Gallery will let you present your parties in a stylish manner. It’s an overall great template with codeless customization, simple installation, effective support and a wide range of features. We sincerely hope that you found something for use in your own project. Feel free to tell us what you think about today’s templates in the comments section.